The experienced Dabang Delhi came back from behind in the final moments of the game to tie the match (32-32) against the young Gujarat Fortunegiants. The Fortunegiants, led by their new captain Sunil Kumar, were first off the blocks as their raiders displayed strong attacking instinct and their defence tackled the Dabang's raiders with ease. Their inexperience came into play as they lost their momentum in the dying moments of the second half and had to settle for a tie. Sachin, their raiding star from last season, started this season well and was the best raider for the Fortunegiants with 7 points. He was ably supported by Rohit Gulia (5 points) and K Prapanjan (4 points). While the raiders fared well, all eyes were on the defence of the Fortunegiants to see whether they could manage without the services of the prolific Iranian duo of Fazel Atrachali and Abozar Mighani, who they couldn't buy back at this season's auctions. While the left corner C Kalai Arasan performed miserably, the right corner Ruturaj Koravi had his moments of brilliance to collect 4 tackle points. The highlight of the defence was the cover duo of Sunil Kumar and Parvesh Bhainswal who coordinated well to get 6 tackle points for their team. The favourites, Dabang Delhi started off miserably as their team selection and lack of coordination led to an all-out in the initial moments of the first half. Crucial changes in bringing in Chandran Ranjith, Pawan Kadian, and Viraj Vishnu at different junctures of the game, helped them avoid, what seemed at a time, a definite loss. 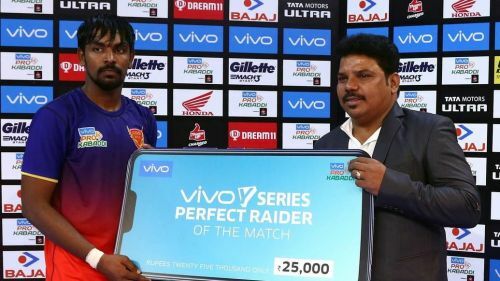 Chandran Ranjith of Dabang Delhi wins the Perfect Raider of the match award. The ex-Fortunegiants man, Chandran Ranjith, turned out to be the Dabang's saviour as he scored 10 points after coming off the bench in the first half. His pace and agility on the court managed to rattle the Fortunegiants defence leading them into committing mistakes. The Delhi captain, Joginder Narwal needs to play with a calm demeanour and make sure that he stays on the court as much as possible to lead his team through crucial moments. His partnership with the 'Hawk' Ravinder Pahal would be key to the Dabangs' fortunes in the tournament. The Dabangs next take on the Puneri Paltan on Friday the 12th, while the Fortunegiants will play against the Haryana Steelers at the Steelers' home venue, Sonepat, on the same day (12th).